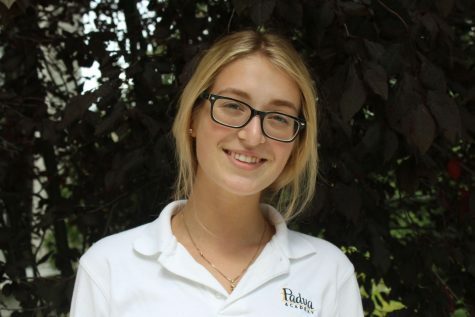 Ava Rudawsky is a senior at Padua Academy. She ran track sophomore year and participated in cheer for two years. Ava has traveled to many places including Hawaii, Miami, and New York where she plans to pursue a career in fashion. She is a graduate from St. Anne’s and has always enjoyed math, but not as much history. She loves going to the beach although she fears drowning in the water. One of her many hobbies is taking pictures. Ava also works as a model in Philadelphia. She was inspired by one of the most important people in her life, her mom, who is also a model. She enjoys going out to concerts with her friends, and likes making food, including one her favorites, sushi. Ava is looking at colleges in New York, but has not yet found one that suits her.